Been lusting over Apple's AirPods but your wallet doth protest? Say hello to Metallic Air Bud Wireless Earbuds! 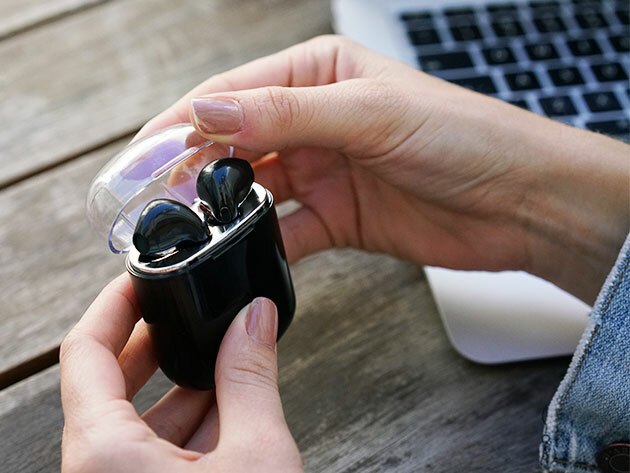 These affordable earbuds are not only budget-friendly, but they're also packed with state-of-the-art Bluetooth technology and amazing audio quality. The kicker is that they're currently 76% off and available for just $26. Metallic Air Bud Wireless Earbuds ensure 2.5 hours of listening per charge. Wanting to listen longer? They also come with a convenient charging case that will power them up ten times on-the-go before it needs a recharge. Available in a variety of colors, these earbuds are stylish, too! Pick from black, white, silver, blue or pink. Because why pay over 150 dollars for Apple AirPods when you could get the same convenience and sleek look from the Metallic Air Bud Wireless Earbuds? Regularly $79.99, grab them today for the bargain price of $26.